On January 8, 2016, Racquel was a front seat passenger in a car driving north on Danbury Road in Wilton, Connecticut. As the car approached the intersection of Danbury Road and Westport Road, a cargo van driving in the same direction to her left entered into her lane with not enough space to safely switch lanes. As a result, the van struck the side of Racquel’s car (side-swiped), causing Racquel’s vehicle to hit a curb, continue off the roadway, and strike a tree. Thankfully, Racquel was wearing her seat belt! The extent of damage was so severe, that it took the Jaws of Life rescue tool to free Racquel from the vehicle. Raquel was treated on sight by EMS services and taken by ambulance to Norwalk Hospital in Connecticut. As a result of the accident, Racquel suffered a broken sternum, back/neck injury (4 bulging discs), pelvic injury and right leg sprain. Turning her head left or right was painful, as was raising her arms. She attended physical therapy three times a week for several weeks in order to decrease pain and improve function. Racquel was also unable to go back to work for several weeks after the accident. Raquel had never been in an accident before and didn’t know what to do. Thankfully, the driver’s husband referred Raquel to The Case Handler team! 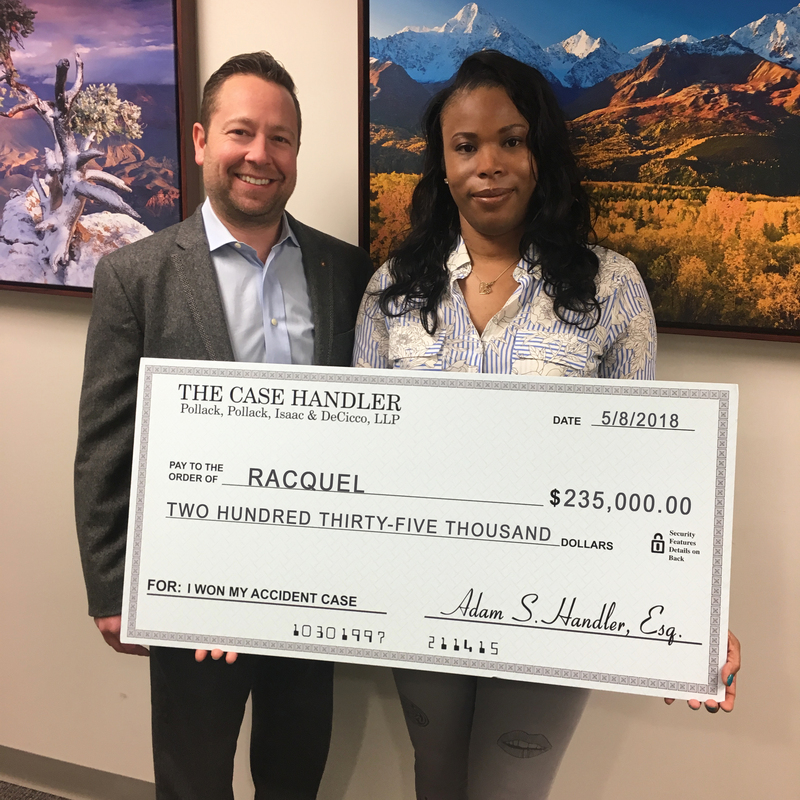 With the help of our experienced New York passenger injury attorneys, we made sure all of Raquel’s medical expenses were paid and our team successfully recovered $235,000.00 for Raquel’s bodily injury claim against The Hartford insurance company! It doesn’t matter if you’re injured as a driver or passenger, getting into a car accident is devastating physically and financially. The silver lining (from a legal perspective) to being a passenger in a car accident is that liability will not be an issue. Liability will fall on the shoulders of the driver(s). So injured passengers usually have an easier case than a driver – but every case is different! If you are a passenger who was injured in a car accident, contact New York passenger injury attorneys that will “take good care of you.” Don’t take our word for it: take Raquel’s.